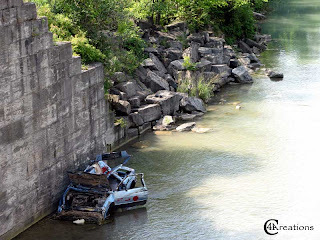 Just off Glendale Avenue, nestled between General Motors and the Royal Niagara Golf Club, lies a curious stretch of wilderness known as the Welland Canal Wetlands. Drive down Glendale and you'll see a sign directing truck traffic to Gate 12. Follow it, and your first turn along Seaway Haulage Road will expose you to the northern end of the Third Welland Canal. Just north of the curve, a dirt trail meanders off into the trees. At the end lies the ruined beauty of Lock 12. This, the most exposed section of the canal, is at the mercy of the weather. Battered by the rain and broken by the ice, enormous sections of the stone wall have broken free to come crashing down amidst the surging waters. Retrace your steps, cross back over the road, and there is an entire series of canal locks waiting to be explored. 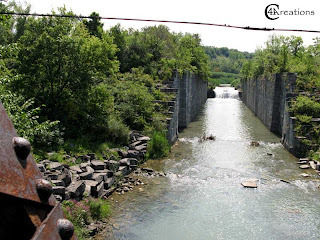 Of these, the first recognizable section you'll encounter is that of Lock 14. 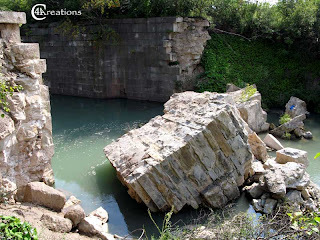 Approach it from the west, and you can climb down along the widely strewn rubble to the base of the canal. Gaze down into the racing current and you'll find the last, lonely gate languishing beneath the shallow water. Over 80 years old, these worn and twisted panels stand strong against the elements, refusing to succumb to the years of damp rot and silt erosion. Continue north, along the canal, and you'll come to Lock 16. 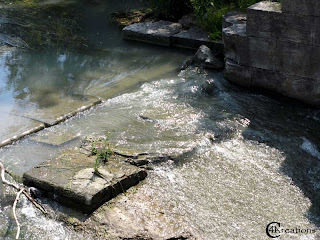 At the top end of the lock, you can clearly see how the steady flow of water has eaten away at the base of the canal, carving new paths as it cascades down the first real waterfall of the canal. The bottom end sports ruins of another kind. Less of a beauty to be admired, and more of a blight to be tolerated, a trio of crashed cars lay upside down upon the bed of the canal. 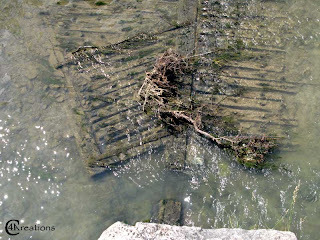 The years have not be kind to them, as the water has slowly pressed them against the canal wall, even as it conspires with the air to rust away the intruders. The next lock is best viewed from the railroad swing bridge that arches over the canal. Still very much in use, the bridge is a questionable perch at best, but somehow irresistible. 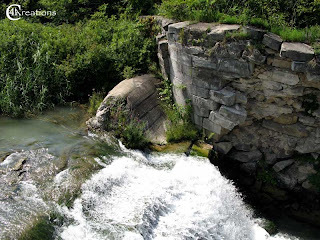 Gaze over the side and you are rewarded with one of the clearest, most complete pictures of a canal lock - from the ruined walls where doors once stood, to the staged waterfalls pouring in from above. 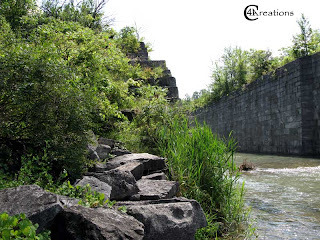 Above those staged waterfalls lies Lock 18, one of the most ruined, and most beautiful stretches of the canal. Here, the walls stand buckled and bent, leaning precariously inward as they strain against the years of decay. In many places, the rocks have split, exposing the older, jagged, softer rock inside. Beneath the waterfall atop this lock lies what used to be a smoothly rounded, curving lip of stone. Today, it's a cracked and broken speedbump, at best, eroding more and more with each passing year. The last lock - if it is, indeed, a lock at all - of this journey is Lock 19. 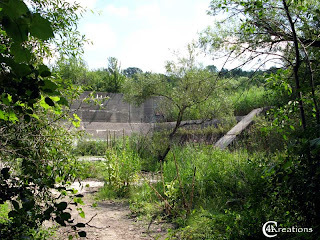 Hidden away within the trees and the reeds, well below the gravel road, lies a dry section of canal. As you push your way through the trees, the steeply slanted overgrown walls remind you more of an Aztec pyramid than a thoroughly North American waterway. Given a good running jump (in a decent pair of boots) and you can scramble up the wall. From here, deep within the wilderness, all thoughts of a canal are gone. There's no water to be seen, no gates to be found, and nothing to suggest upon what you may have stumbled. 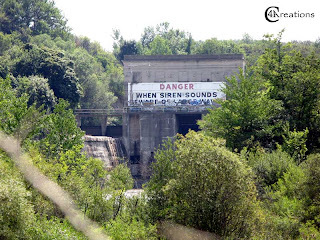 Climb a little further, however, and you are rewarded with your first glimpse of the Pumphouse - affectionately known as 'Siren Sounds' for obvious reasons. I've been having fun exploring the area and looking for different ways to get to the east ghost tunnel.